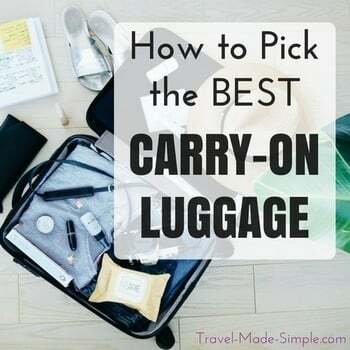 When you travel do you like climbing towers and hills to get a view of the city below? Prague is a great place for this. It has several hills and a number of towers to climb, and a spectacular cityscape to view. There are numerous buildings that make for an interesting skyline and a river to look down on. 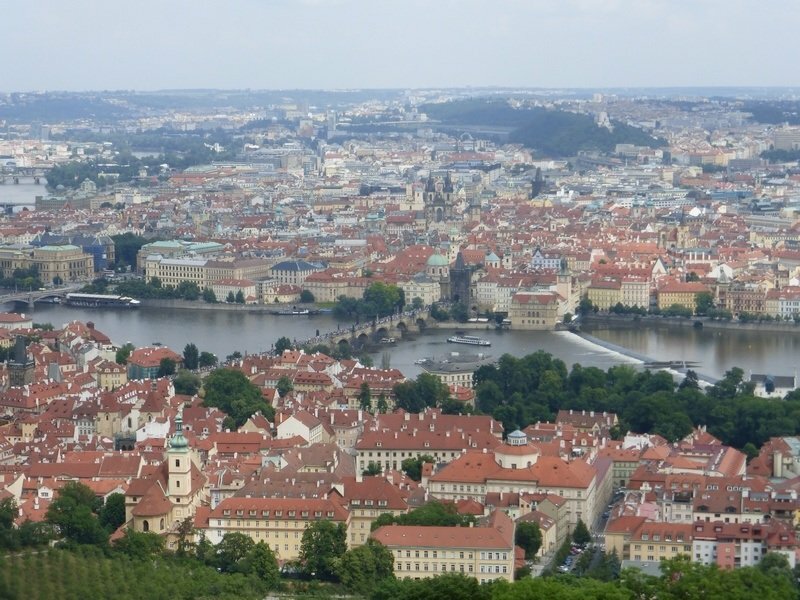 This post looks at 5 places you can climb to view Prague from above. Some are free, others charge a fee. Some have stairs and a few have an elevator, so you can pick your best bet. This historic center of Prague is Old Town Square. One side of it is Tyn’s Church and the other is the tower of the old town hall. The side of this tower has an Astronomical clock that draws large crowds every hour to watch little figures move. You can climb the tower though. You have to go into the building to a specific elevator and go up a few stories to the base of the tower, pay your fee and then either climb the stairs or take another elevator to the top. 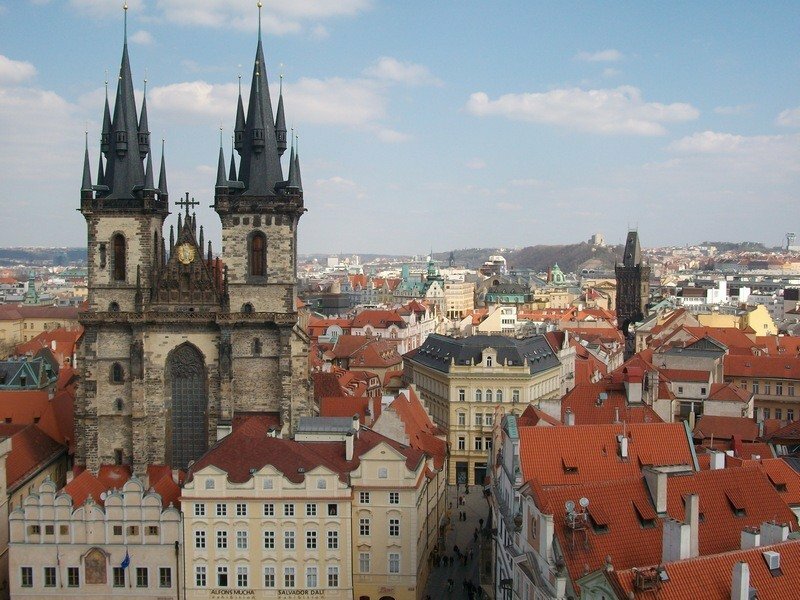 If you want to see Prague from above but you only have time for a single tower, do this one. The views are wonderful of both the town and the square below. Try to be up there for the hour changing though. We were there a few years ago and there was trumpeter in costume blasting out the hour on all four sides. See more info here. 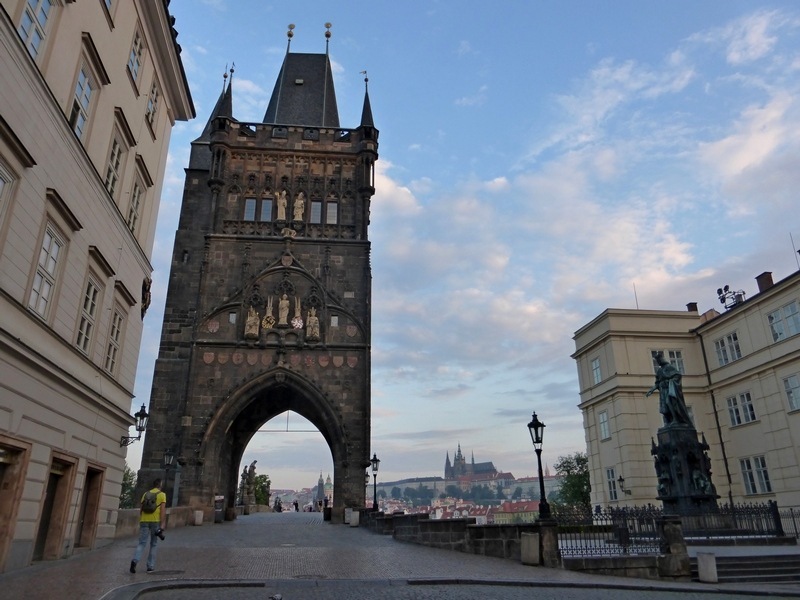 This former city gate dates back to the 11th century when it was one of 13 entrances to Prague’s old town. It’s only a few blocks from old town square. The name was changed to the Powder Tower in the 17th century when it was used as a storehouse for gunpowder. Buy your tickets at the box office on the first level up from the ground. Then climb the narrow spiral stairs to the observation level above for a good view of the old town skyline. See more info here. If tight stairs and/or having to pay for a ticket are a problem, you can still get great views from the outdoor hills. One great spot is the plaza around the Metronome. The Metronome is a bit of moving art that is supposed to remind us of the inevitable marching of time. It also offers a great view of the city. Parizska street from old town square leads to the Chechuv bridge across the river right below the Metronome. From there, just climb the stairs until you get to the top. From the metronome there are paths that run along the hill top. Explore these for other view points. The day we were up there, the little plaza below the metronome itself had a little bar shack selling drinks and a bunch of people in lawn chairs enjoying the sun. 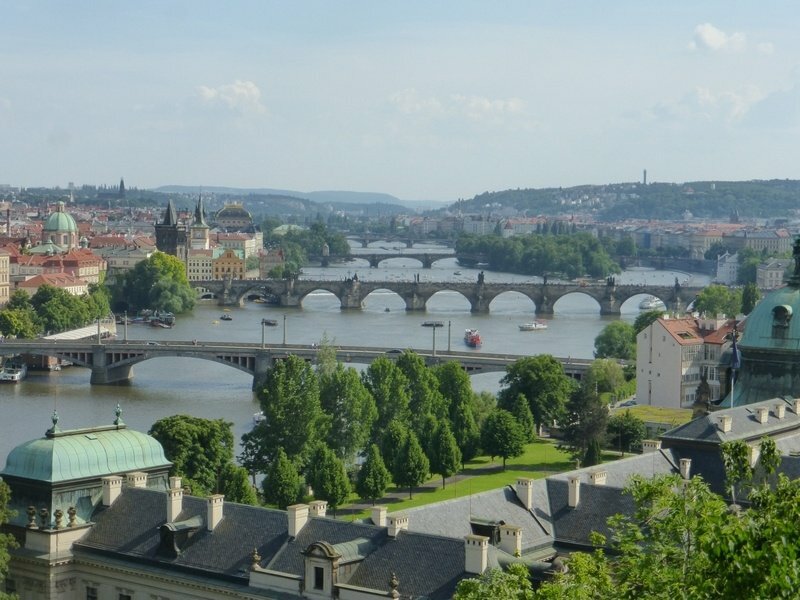 Cross the river from old town and wander up the winding streets, you’ll find yourself at the Prague Castle. At the top of the road that leads from the Charles Bridge is a courtyard in front of the main castle gates. From this plaza, you can get a good view of the city and the river. The plaza is free, and though steep, it’s accessible by walking up a road instead of a bunch of narrow staircases. If you are on Castle Hill and want an even better view, look to the south tower of St Vitus’ cathedral. There is a fee and assuredly the narrow spiral staircases native to any cathedral tower, so if you missed that at the plaza, then here you go. One of the highest spots in town, it is worth a try. NOTE: We haven’t actually tried this one, but it sounds awesome. See their website for information. Visible on Petrin hill west across the river from old town is a small replica of the Eiffel Tower. The tower was explicitly built to be the highest spot in town. 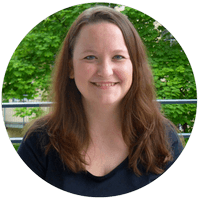 There is a tiny lift for an extra fee, but if you have the legs, it is worth the climb just to enjoy the double helix stairs. There are even a few little benches along the way if you need to catch your breath mid-climb. Take public transport down to the stop Ujezd. Nearby is a funicular that takes you up to the top of Petrin hill. It is a part of Prague’s transport network, so if you have a day ticket you are good. You can walk up the hill if you are so inclined, but the funicular is fun. At the top, there is a network of paths and sights. Follow the signs to the observation tower for the highest point in the city. Climb this mini replica of Paris’ Eiffel Tower for a view down on the city. The top is tight, but it provides great views of Prague from above. See info on their site here. Food tip: Across from the tram stop at Ujezd is Angelato, one of the best ice cream places we have tried. There was a long line out the door, but it moved quickly and it was totally worth the wait. There are plenty of other towers in Prague to head up. Here are a few more. To the west of the center is a awkward looking tower sticking up from a park. This is the TV Tower. It has a restaurant, but also an observatory. You’ll also notice odd statues of babies crawling up it, which were designed by David Černý. See more info here. Both ends of the Charles bridge are guarded by towers, which can both be climbed. The bridge is one of the visitor highlights, so a bit of a different view on it could be fun. Read more on the Lesser Town Bridge Tower here and the Old Town Bridge Tower here. This church is in a square nestled beneath castle hill. The bell tower is climbable as well. See more info here. If towers are your thing and you think you are going to do a lot of them, look at the Prague Towers Ticket. 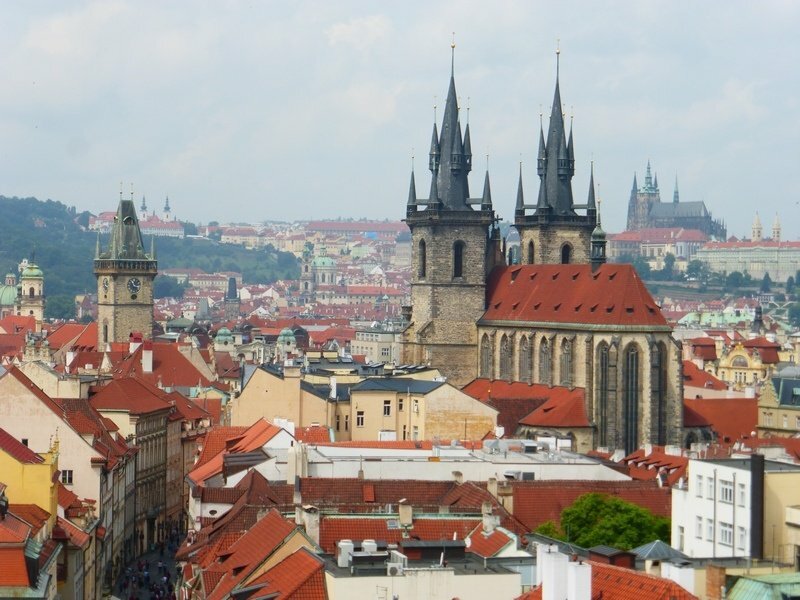 The Petrin Observatory, Powder Tower, Belfry at St Nicholas, and the two Charles Bridge Towers are run by the city and offer a combo ticket.